Learn how to prepare the spicy and tasty Meat roll recipes at home. Pressure cook the boneless chicken pieces with red chilly powder, pepper powder, salt and ½ cups of water up to 4 whistles. Allow it to cool and mince the meat. Beat the eggs in a bowl well and keep it aside. In a pan add butter, onion, ginger garlic paste, green chilly paste and saute it till onions become brownish. Transfer the minced meat into the pan and mix them well. Heat it in low flame for around five minutes. Mix the all purpose flour (Maida) with water and salt to make a batter similar to that for Dosa (Semi liquid consistency). Heat a tawa in another stove, lower the flame and pour one spoon full of batter in to the tawa and rotate with the back of a spoon to get the circular shape (Maida appam). After 2-3 minutes flip the “Maida appam” and get the other side also cooked. When the “Maida appam” is ready, transfer it into a plate and take some of the meat mixture and spread it on top center of “Maida appam”. Now roll it from sides and seal it on the both edges. Dip each of the rolled “Maida appam” in the beaten eggs and then into the breadcrumbs – semolina mix, making sure that all sides are nicely coated (Similar to Chicken cutlet). Repeat steps 8 to 12 with remaining batter. In another pan heat the oil and fry the coated “Maida appams” in medium flame till they become golden brown. Don’t forget to flip them in between. Transfer them to a Kitchen tissue and drain the excess oil. 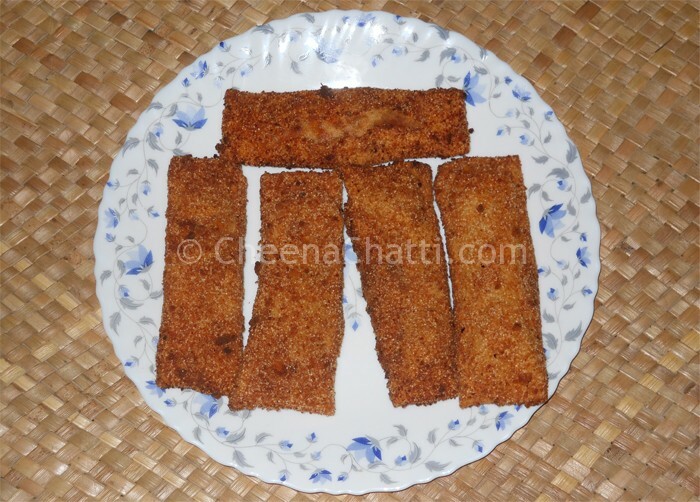 This entry was added on July 11th, 2013 by Cini P Moideen in Bakery and tagged with meat roll bread recipe, iftaar recipes, meat roll up appetizer recipes, meat roll kerala, meat roll ups, ramzan recipes, chicken, meat, meat roll up recipes. Last revised on April 4th, 2018.